Thank you for subscribing to TheChessWorld.com! Many email and internet companies are using programs to block unwanted emails, often called spam. Sometimes, however, those programs block important email you actually want to receive. Be sure to add the corresponding TheChessWorld.com email addresses to ensure the best chance of getting our emails and updates on a timely basis! A whitelist is a list of email addresses or website names from which an e-mail blocking program will allow messages to be received. Unwanted emails, commonly known as spam, has become a big problem. The email blocking systems are far from perfect and often intercept genuine and high-quality emails together with spam. In order to prevent email delivery interruptions, you need to whitelist us! After this step, you’ll see all of our future emails in your Primary inbox! Go to the ‘Junk Email’ folder. 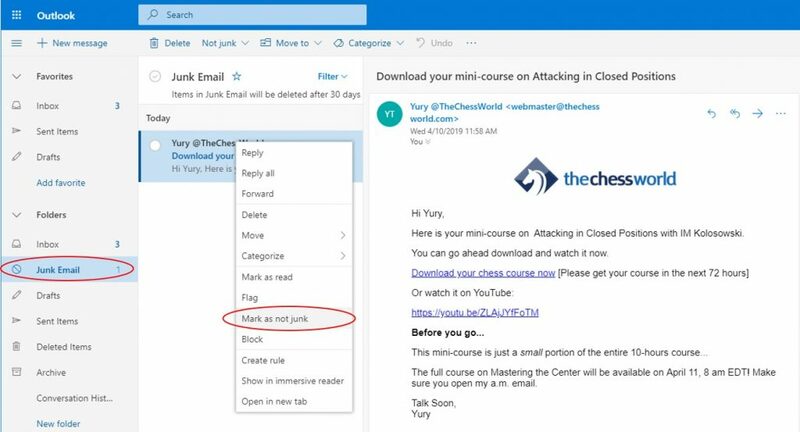 Right click on the email from TheChessWorld.com and select ‘Mark as not junk’. The email should automatically get moved to your main inbox. Hope you do take those necessary steps to ensure you get all the important emails from us, and nothing will interrupt your chess training!